The skin is the largest organ of the body. In order to truly detoxify and treat your body in a clean and natural way, you apparently cannot slather toxins on your body. That's what I was told a few years ago when my beauty blogging pals at Tall Short Blog gasped as I dabbed, drizzled and doused myself in parabans as a nightly ritual. After a thorough explanation of the damage I was not only doing to the outside, but also inside of my body by using these chemicals on a regular basis, I began to slowly but surely take their advice on clean beauty products and venture into the rabbit hole of green beauty. A couple of years later, I am still playing around with what my favorite products are but have many favorites that I have tried and tested. I have tried a range of prices and compared them to other less green products that I have used in the past and still occasionally use. 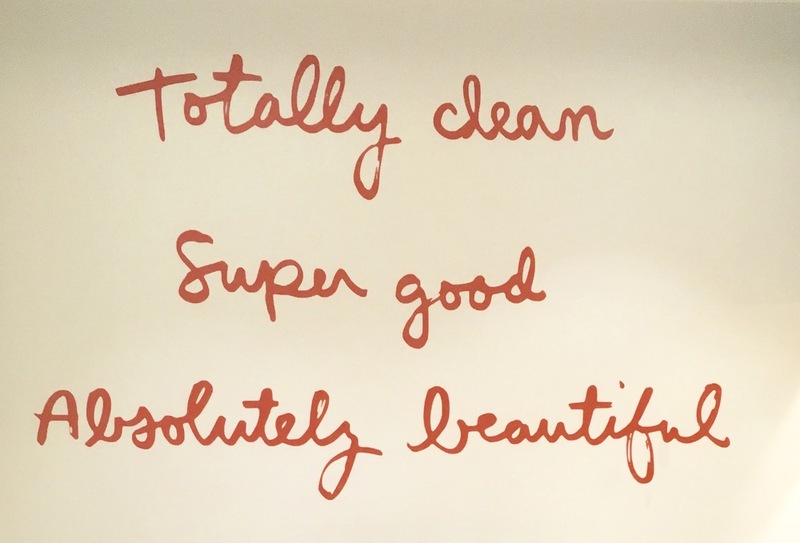 The green beauty Mecca, Credo, recently opened a gorgeous location in SoHo. Many of the products below have been purchased from there and can be found on their, or the product company's website. Cleanser- After testing a few face oils and washes One Love Organics Vitamin B Enzyme Cleansing Oil is by far my favorite. In the past I used the Boscia one from Sephora, and have recently tried the coveted Marie Veronique Daily Exfoliating Cleanser. While I liked her cleanser, I could not get it to lather the way that was demonstrated at Credo. I also thought the oil felt a little thicker than the OLO one and was harder to rinse off. I learned from Elizabeth at Credo that it is key to really give any of these oils time to break down makeup. Giving yourself an extensive face massage will do just that. Exfoliator- I do not use a scrub on my face because my skin is so sensitive, however still need to exfoliate. The best product that I have found that is gentle and exfoliates for cheap is the OLO Cleansing Sponge. It is a much less harsh and more affordable alternative to the clarion if, which I used to use religiously until I realized it was too harsh for my skin, and getting way too expensive. According to Credo, massage your face with it once a day in conjunction with your cleansing oil and rinse and ring it out. It should last up to 3 months with proper care. I tried the Herbivore Blue Tansy Mask to decongest my pores. It felt really great on my skin, however I did not see any improvement. I love exfoliating my lips with this local Moss Hill Sugar Lip Scrub. Hydrating- I use a prescription retinol at night, though I would like to eventually switch to one with more natural ingredients. Therefore I need my other products to be very gentle. I love OLO's Vitamin C facial serum. It is quite pricey though, so combining it with tea tree or jojoba oil makes it last longer. I used to use a retinol eye cream with lots of scary ingredients because I didn't believe that an all natural one could really work as anti-aging. Elizabeth at Credo explained the benefits of each ingredient in Skin Owl Eye Plus and more importantly suggested how to use it. She recommended storing it in the fridge and applying it with a depuffing eye massage. After I gently dab it on with my ring finger, I carefully and gently roll my finger from one side to the other until I have covered the entire area. My eye puffiness is completely gone and the coloring has improved drastically. Andalou Naturals has a nice quick rose water moisturizing mask that feels and smells great. My go mask is simply Greek yogurt and raw honey though. Spotlight on: Affordable "Drugstore Products" These can all be purchased at organic groceries. Wash- I sometimes shower multiple times a day, but know how bad it is to strip the oils from your skin and hair, so I like using olive oil soap to avoid this. I also sometimes use the Acure Clarifying Body Wash. I am obsessed with Acure's products and have tried and tested them against many more expensive organic products. They work great, are affordable, have great ingredients, and are convenient since they are sold in most organic grocery stores. When I am on the go and don't have time to shower after a workout, I absolutely love Yuni Instant Shower Sheets. They leave my skin feeling clean, soft and smelling good with no scary ingredients. Moisturizer- I am addicted to the OLO Antioxidant Body Serum. I got it as a treat for myself before my wedding to get my skin really glowing and hydrated and got hooked. It's splurge worthy and lasts a while since it's a spray bottle. I like to finish hydrating with Acure moisturizers. I used to be hooked on Aveeno moisturizer, but the Acure Cocoa Butter one is unscented and feels even better (plus is all natural). Los Poblanos Lavender Salve is the best all natural substitute for Vaseline. I keep it next to my bed and put it on my hands and lips every night. Deodorant- I tried this calming lavender deodorant, which smells amazing, but have to go back to the Dove one I have always used until I find a more effective alternative. It could not last the day, especially through workouts. Shower Products- After thorough research on organic shampoo and conditioner, I settled on testing the most popular inexpensive versus expensive product. I used the Rahua products for a while, then Acure products. I noticed no difference and the Acure products are way cheaper and easy to purchase locally. I like all of their shampoo and conditioners, just depends on your hair type (I use the volume one). Post-Shower Products- I am addicted to the Oribe Detangling Primer, so attempted to trade in for the Acure equivalent. They are just not the same! The Oribe is still my very favorite. I use the Oribe when I am about to heat style my hair and the Acure otherwise on a regular basis. I was sent OLO's dry shampoo as a gift when I made my last purchase, but have yet to try it. 📷 taken in Credo Beauty SoHo. How everyone should feel about what they put on the inside and outside of their body. Next I need to take the plunge into all natural makeup products. Please comment with organic beauty product favorites!